Das Kränzchen macht etwas Arbeit. Ich finde aber, sie lohnt sich. 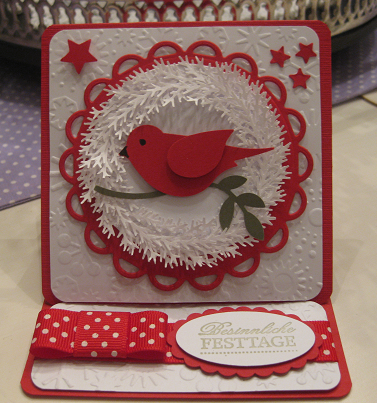 Beautiful card, lovely use of the image. Thanks for playing at crafty ribbons and winter wonderland. Gorgeous card. Thank you for joining us for this week's Winter Wonderland Challenge. This is just gorgeous. Thanks for joining us at Polka Doodles. This is absolutely adorable, Beate! Cute birdie! Thanks for joining our "To Die For" challenge at PolkaDoodles.